We know that a Scrum project involves a collaborative effort to create a new product, service, or any other result. So we need to define, how the methodology works for a project, program or portfolio. But before that, we need to define these three terms. Project—A project is a collaborative enterprise to either create new products or services or to deliver results as defined in the Project Vision Statement. Projects are usually impacted by constraints of time, cost, scope, quality, people and organizational capabilities. The objective of project team is to Create Deliverables as defined in Prioritized Product Backlog. Program—A program is a group of related projects, with the objective to deliver business outcomes as defined in the Program Vision Statement. The Prioritized Program Backlog incorporates the Prioritized Product Backlogs for all the projects in the program. Portfolio—A portfolio is a group of related programs, with the objective to deliver business outcomes as defined in the Portfolio Vision Statement. The Prioritized Portfolio Backlog incorporates the Prioritized Program Backlogs for all the projects in the program. Since Scrum favors small teams, one may think that this method can only be used on small projects, but this is not the case. Scrum can also be used effectively on large-scale projects. When more than ten people are required to carry out the work, multiple Scrum Teams may be formed. The project team consists of multiple Scrum Teams working together to Create Deliverables and Product Releases, so as to achieve outcomes desired for the overall project. Since a project can have multiple Scrum Teams working in parallel, coordination between different teams becomes important. The Scrum Teams usually communicate and coordinate with each other in a variety of ways, but the most common approach is known as a Scrum of Scrums (SoS). Members representing each Scrum Team come together to discuss progress and issues and to coordinate activities between teams. These meetings are similar in format to the Daily Standup Meetings; however, the frequency of the Scrum of Scrums could be pre-determined intervals or they could be coordinated as required by the different Scrum Teams. A Scrum of Scrums Meeting is an important element when scaling Scrum to large projects. Typically, there is one representative in the meeting from each Scrum Team—usually the Scrum Master—but it is also common for anyone from the Scrum Team to attend the meeting if required. This meeting is usually facilitated by the Chief Scrum Master and is intended to focus on areas of coordination and integration between the different Scrum Teams. This meeting is conducted at pre-determined intervals or when required by the Scrum Teams. In organizations that have several Scrum projects happening simultaneously, the Scrum of Scrums meeting can be scaled up another level to what is referred to as a Scrum of Scrum of Scrums meeting. In this situation, a separate Scrum of Scrums Meeting is held to coordinate each group of projects that are directly related to each other. In this example, there are six projects taking place simultaneously. Three of the projects are directly related to each other: projects A, B, and C. The other three that are directly related to each other are projects D, E, and F. A Scrum of Scrums meeting is held to coordinate the interdependencies between the projects in each directly related group. Then a Scrum of Scrums of Scrums Meeting is conducted to coordinate and manage the activities of all projects. These roles are similar to those of the Product Owner and Scrum Master except they meet the needs of their program or business unit rather than those of a single Scrum Team. The needs and structure of each organization are different. 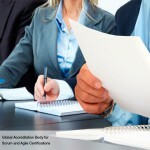 It is the responsibility of the Scrum Guidance Body to scrutinize the organization at different levels to understand and define appropriate application of Scrum and to act as a consulting body for everyone working on a project, program, or portfolio. When applying Scrum to manage projects within the context of a program or portfolio, it is strongly recommended that the general principles of Scrum presented in this publication are adhered to. It is understood though, that in order to accommodate the overall program or portfolio activities and interdependencies, minor adjustments to the set of tools, as well as the organizational structure may be required. Portfolios and programs have separate teams with different sets of objectives. Program management teams aim to deliver capabilities and realize certain goals that contribute toward the achievement of specific program objectives. In contrast, the portfolio team has to balance the objectives of various programs to achieve the strategic objectives of the organization as a whole. The problems and issues faced when using Scrum within a program or portfolio primarily involve coordination across numerous teams. This can lead to failure if not carefully managed. Tools used for communication need to be scaled to match the requirements of the many teams involved in a program or portfolio. Each Scrum Team must address not only internal communications, but also external communications with other teams and the relevant stakeholders of the program or portfolio. One key stakeholder is the sponsor—the individual who provides the funds and other resources for a project. Sponsors want to understand the financial bottom line related to a product or service and are typically more concerned with final outcomes rather than with individual tasks. What is the basis of the Scrum framework? What is the purpose of the Quality aspect in Scrum? Is it recommended to use Scrum for large and complex projects?